As Desiree points out in her speaker interview, if you don’t measure your effectiveness, how do you know you’re getting anything done? For that matter, how do you know when to celebrate? How do you know to feel good about what you’re doing? This year, the Secular Student Alliance set another new record for fundraising, a specialty of theirs. They’ve raised this money through a wide variety of campaigns and strategies, some bog standard and some…highly creative. 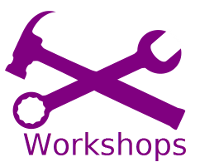 Bring a project you want to fund to this workshop and prepare to walk out with a plan: know where to find your funders, what they want to support, and how to make them happy about how their money is used. Are you prepared to interact with the media? If you have 15 seconds on local TV or 200 words in the paper, can you use them effectively? Can you write a press release that gets the important information out about your work or your event? Are you prepared if someone wants your headshot? In conjunction with this workshop, professional photographer Ben Zvan will be set up to provide free headshots to conference attendees. We have ideas. We have lots of ideas. However, we want our workshops to be driven in part by the needs of our attendees. Those who buy tickets through Kickstarter will have a chance to recommend and vote on workshop topics.